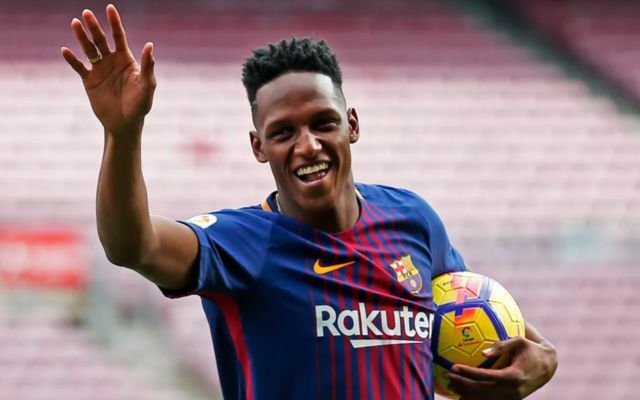 Colombian star Yerry Mina has reportedly re-emerged as a target for Liverpool just months after first being linked to the club. The defender only joined Barcelona in January but saw his first-team minutes limited as an understudy to Gerard Pique and Samuel Umititi. It was claimed in May that Mina has agreed to join Liverpool on a loan deal this summer and already informed his teammates at the Nou Camp that he was leaving for Anfield. Such suggestions failed to receive the support of the notoriously more reliable British media, although that hasn’t appeared to diffuse the rumours. Liverpool are now contemplating a move for Mina on the back of his impressive World Cup, according to Fotomac. This follows Mina himself recently quashing the prospect of a summer move and committing to his fight for a place at Barcelona. Yerry Mina’s injury time goal cancels out Harry Kane’s penalty. The 23-year-old was almost an instrumental figure in inflicting English heartbreak on Tuesday as he scored a towering 93rd minute header to take Gareth Southgate’s men into extra time. It marked his third goal of a World Cup in which he has regularly showcased his brute strength, aerial supremacy and notable composure on the ball. As accomplished a player as Mina looks, it seems unlikely Jurgen Klopp will be in the market for another central defender this summer.